This one would be saying something like "For crying out loud, lady! How long does it take? All I want is two finished sleeves and some kind of neck finishing. Sheesh! Cast on and cast off at the neck! A half inch of sleeve and the edging. Come on!" And I'm in full agreement. It's not the sweater's fault. I'm nearly there, and would have been done if I hadn't had to undo all of the "done," but now my hands are really acting up, braces and therapy notwithstanding. Besides, the sweater isn't going to pay me to do something that freaks my hands out (neither does the toddler, but she's more vocal) and if I'm going to do something painful and ennumbing -- is that a word? -- I'm going to write that darn curriculum. And my babysitter is out of town. Oh, well, I mean, hours and hours of TV can't actually harm them, right? Edited to add: I just sucked it up and ordered another skein of yarn. If I'm going to spend this much time with this sweater, I might as well make it long enough to last for at least another 10 minutes. Any bets on how long it takes for the AWOL yarn to show now? I still swear that TV is how my younger two learned to read (PBS rocks), and you know how early they read. Truly, it's not all bad! I feel your pain on not enough yarn. Still if it's worth doing... It looks lovely so far. Imagine how much better you will feel when it is all done and dusted! Now, while you wait, plonk the kids in front of the tube and get writing! Looks good so far! I'm with bfmomma on PBS - I learned to read by 3 and my mom swears it's the reason! Plunk 'em down and get your writing/knitting groove on! Good heavens! I think that sweater heard of your sweater a month plan and decided to thwart you. It looks great, so far, as long as it cooperates from here on out. Let's see.... you just ordered the yarn... so I'm thinking that the AWOL yarn will appear just as soon as the shop deposits the package with your order in it in the mail/UPS driver's hands so it is well and truly not cancelable. 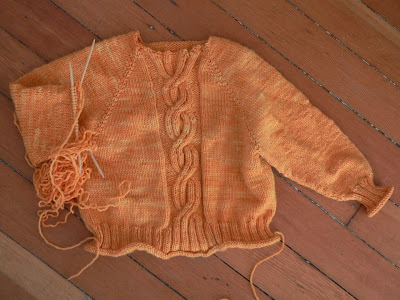 I feel your pain ... Hopefully this sweater will be done soon and you can move onto something less frustrating. Yikes... it's been a rough couple of days, huh? As to the grand plan of a sweater a month, I think you should be granted some grace here. February is the shortest month, after all! It'll be worth the wait. It's a gorgeous color! The AWOL yarn will no doubt show up about a month after you've finished. Or, just in time for FYS 2007. Oh my, I just read your last post and whew! I would've gone bonkers. As for the sweater, I'd just do a simple crocheted collar. Maybe a row or two of crab stitch. Just to be done with it already.